1) My female students saw a picture on the background of my computer of me with some friends and assumed the boy sitting next to me was my boyfriend (of course, because literally every boy they EVER see me with is automatically my boyfriend). They then continued to call me Bella and him Jacob. As in, the characters from Twilight. So, that was how my day started. 2) I had to write and re-write questions for the final exam. I hate writing exam questions. Seriously, I didn't like it America when I actually knew somewhat what I was doing. Here, I don't know what I'm doing, and the test is way more important. Ugh. 3) I completely blew one of my student's mind when I told him that in America gay people can get married in some states. I don't remember how we ever got on the topic, but he simply couldn't believe that in America two guys could actually get married. He asked about kids and I told him some gay couples adopt kids, and his mind was blown even more. He told me that when they get older the kids must be sad and crazy because they did not have "a mother's love." I told him that actually many kids have gay parents and are very happy and healthy. The whole conversation was totally incomprehensible to him, and he just kept looking at me in complete disbelief. So yeah, that's where Korea stands on that issue. Wow. 4) I found out I don't have teach anymore night classes! YES! I'm assuming they'll start back up with the new semester, but I'm so glad to have my Tuesday nights back for now. My co-teacher did tell me that one of the boys said he still wanted to have class and was disappointed it was over, which was nice because I rarely get any feedback about anything. 5) I got an absolutely awesome package from home. 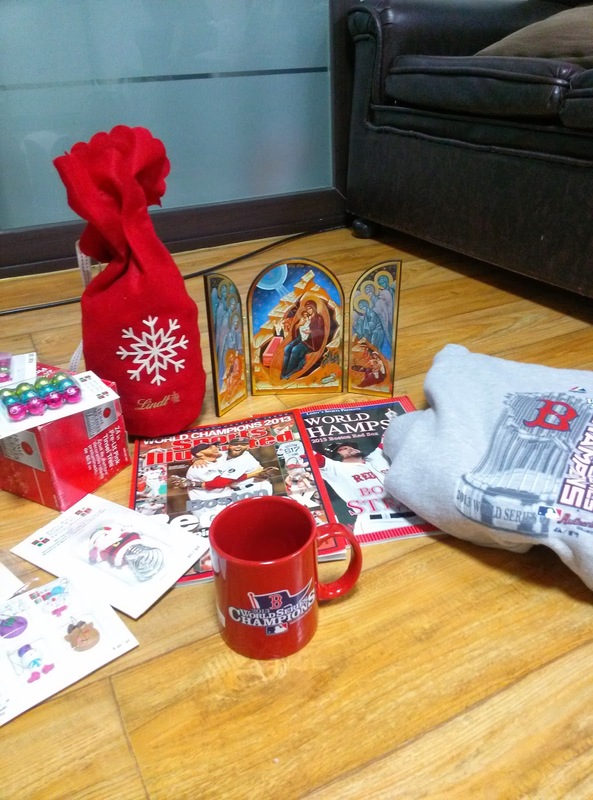 Complete with a Red Sox sweatshirt, mug, Sports Illustrated, a huge bag of Lindt chocolate, Christmas decorations (including a little tree. Yes, now I have 2! ), and my personal favorite, an icon! Yes, you know you're probably a Melkite when your care package contains an icon. And it's a sure sign that you actually are when you're really excited about getting an icon in your care package because you know a home isn't a home without some icons. Anyone who lives abroad knows how awesome it is to get packages from home, and this was extra special because it was unexpected and filled with pieces of home. My parents are truly fantastic.